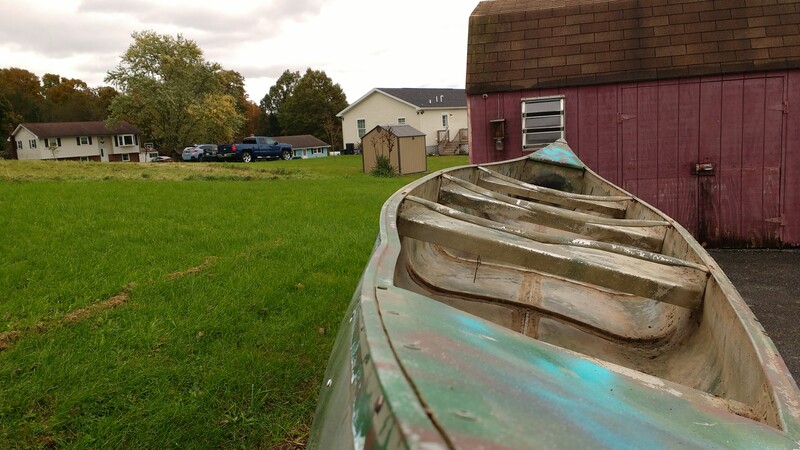 I live in a part of Pennsylvania where camouflage is the uniform of the day, and I see more camo canoes & kayaks than anything else ... nut none quite as ugly as mine. Don't ask me about the wretched artwork; I didn't do it. The turquoise squiggles confuse me. But she doesn't leak due to some really ugly, but apparently effective remedies. This summer, the multitude of storms that passed through took a couple swipes at her, blowing her off her horses and then breaking a branch off of a tree and crunching the stern on the starboard side. Photos of the beautiful boats here have inspired me to do something about the visual state of this boat. It'll never be pristine again, but I can make her really shine. Here she is in her current state after stripping most of the hull. Today, I'll attempt to massage out the large crinkles at the stern. Progress photos later. Well kudos to you but you see the planter in the picture? It might be better to add to your planter collection.. I have nothing against utility canoes but that one has been wrapped and straightened as much as it can be.. It will never perform better than a floating raft. The middle is lower than the ends.. hogged. This makes the boat much harder to turn than it should be. Yours does float however and it would be OK for fishing.. Check all the rivets carefully.. Leaks often start there. Hmmm... What sort of weaponry will you be installing? Deck guns? Torpedo launchers? 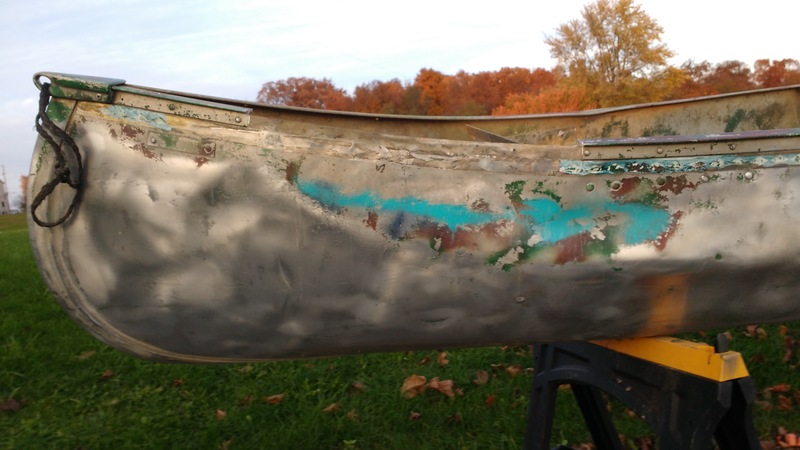 The last canoe I owned had been painted flat black by the previous owner. That would certainly complete the look. I'll be interested to see how you revive this old classic - even if you forego the machine guns. Deck guns and torpedoes! That would sure come in handy for those pesky full throttle bass boats! I think you've got it! Looking a bit better. I'll work on this a little more later. This wrinkle will be a bit more challenging. What a place for a mouse to make a house! I'll fill that up with Great Stuff and trim it to shape. Inboard shot of the wrinkle. That's it for today. Back to the indoor shop to make some custom dent pulling tools. 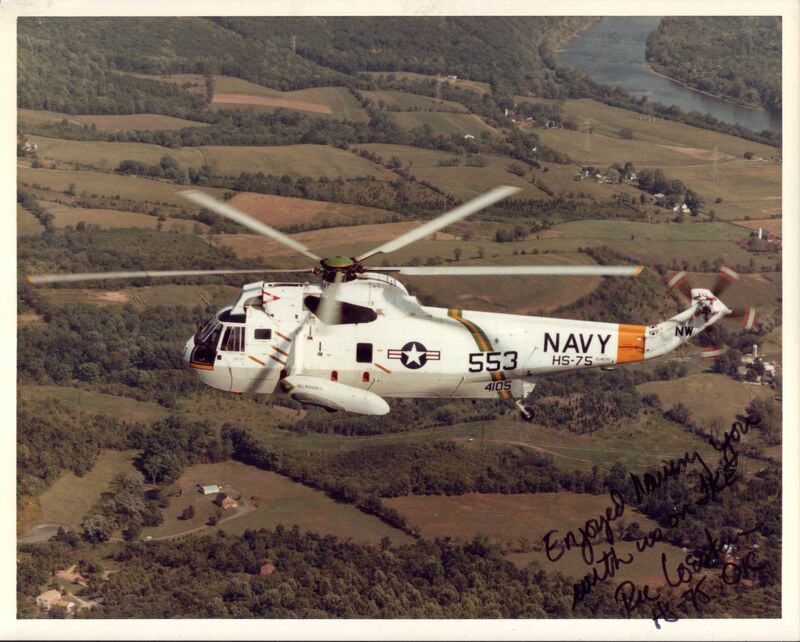 Uh - is that how big choppers are fixed too? We didn't get to reinstalling the rivets yet. What were they thinking with that color scheme? That poor canoe! Kudos to you, Schuylkill, for trying to turn a sow's ear into a silk purse. Am betting you'll succeed. Ha! I don't know ... funny thing is, no one has ever said anything about the paint. It'll still show plenty of battle scars, but at least it'll shine. 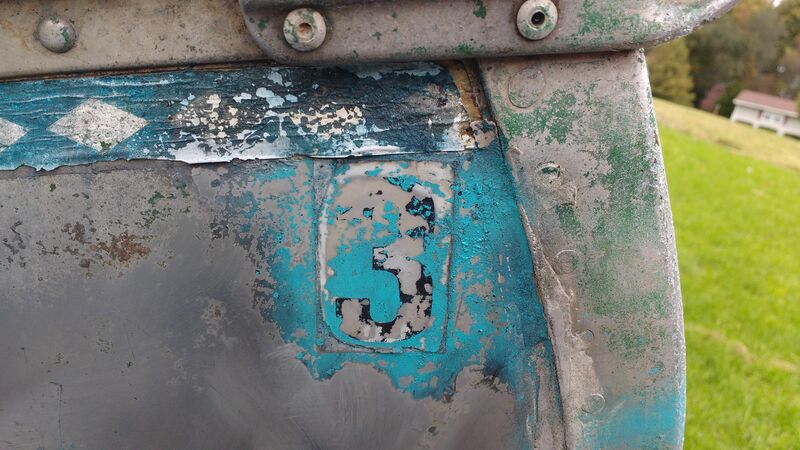 I think it used to be a rental canoe, having the four seats and this number 3 I found beneath the paint. You can get $ for aluminum scrap. I just caught this thread, was away for the wknd in the land of almost no web services. Granted my expertise in older canoes is thin to none. But this one doesn't come down to knowing a lot about canoes. IMO this is about recognizing the work that someone is willing to do to restore a craft and be able to get on the water rather than whether others would choose the boat for themselves. As to getting rid of it... I don't how many people here have tried the recycling route the last year. But the price for mixed metals and the outlets to get rid of oddball stuff has dropped thru the floor since China stopped paying good prices for our junk the beginning of this year. The last time I dropped off a load of mixed metals I got almost the price of the gas to drive it there. Happily I live in a city and we have guys cruising the alleys that will pick up mixed metals and aggregate them for a useful load. The suburbs tend to frown on piles of crap left out. If a boat can be gotten ready paddle I applaud it. 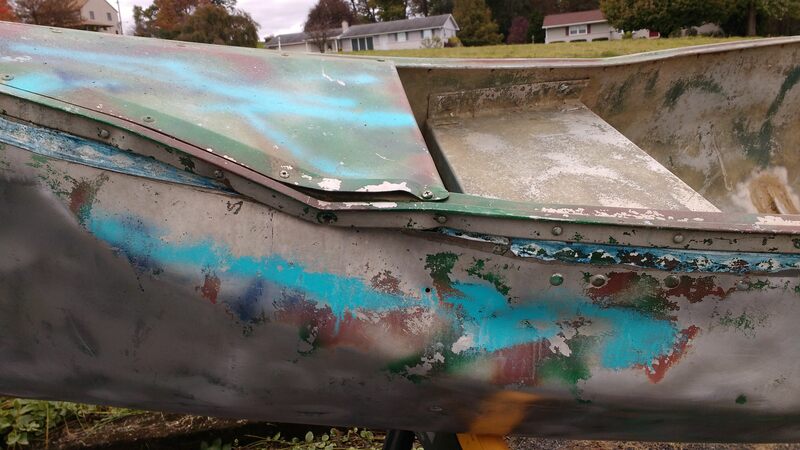 If this was someone trying to turn an ancient home-made fiberglass WW boat into a sea kayak to go on an long cruise, I would first out of the door saying it was not worth effort. But that is not what this is. It is someone who obviously has a lot of skills for this purpose and is sensible. 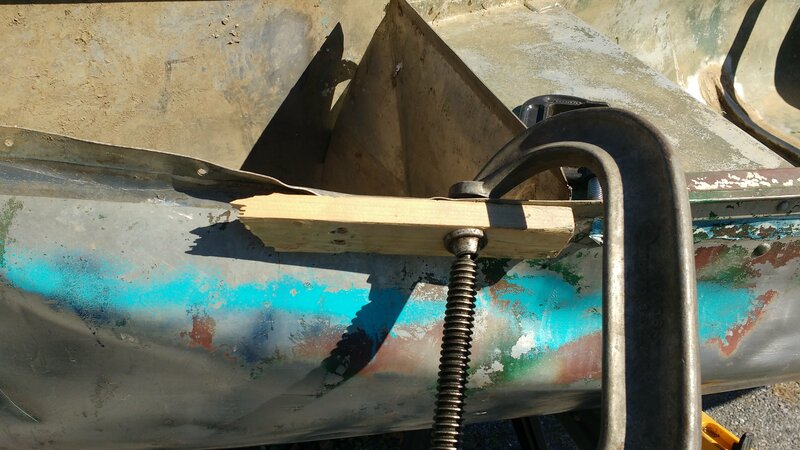 This keeps a boat out of the junk heap - it is a good thing. And how will you do that? Inquiring mind wants to know.. 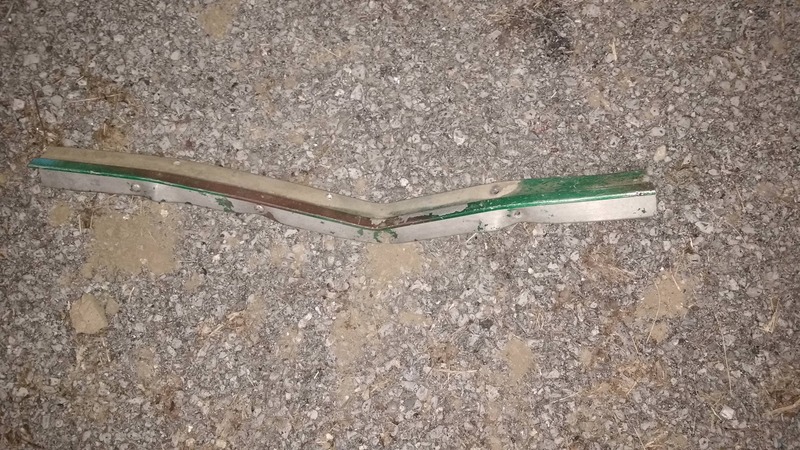 I wrapped an old alu Grummy and no amount of jumping on it would make it come back to level.. Something needed to lift the stems and push down in the middle..
Also re the end fold.. as its going to be weak at that fold how can you reinforce it? Good grief, don't jump on your boat! You're supposed to be kind to it! No, not the stems. That would risk crinkling and destroying the entire canoe. 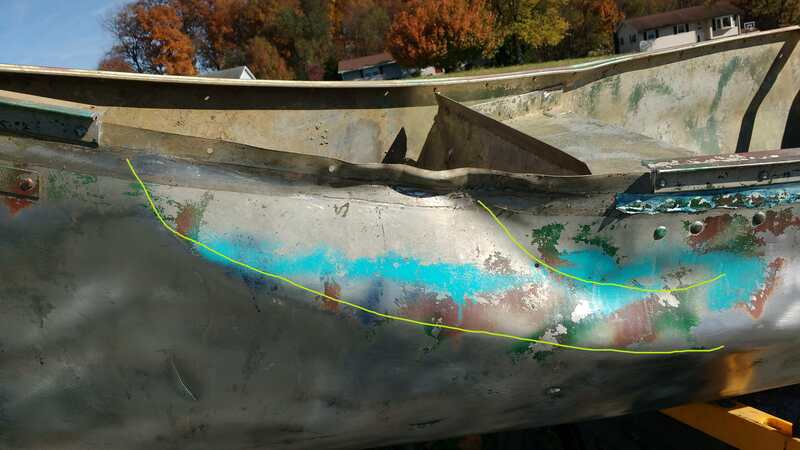 The straight parts of the aluminum keel have to be supported as well as the sides of the braces inside, otherwise they could be forced through the skin destroying the hull. Forces a slight percentage higher than the forces that hogged the hull will be gently but firmly applied in the opposite direction. It won't be very weak at all. That heat treated aluminum is very tough stuff. No reinforcements will be needed. Yes, Bondo is very heavy. Anything man can make ... man can repair.. 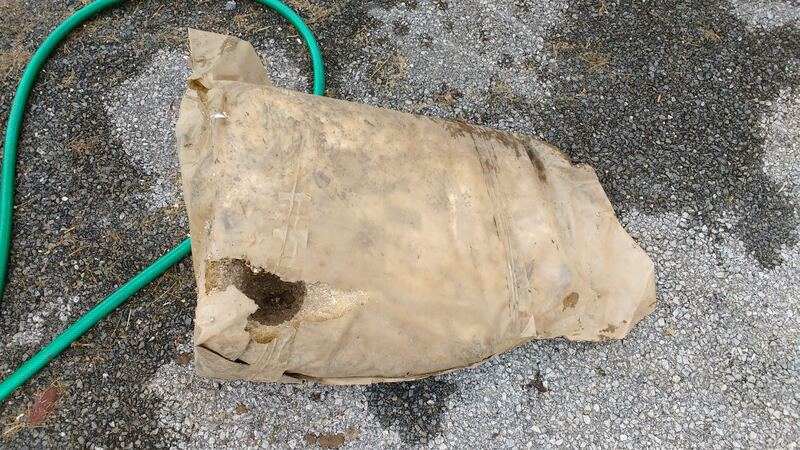 I would restore the flotation and seal any leaks, but otherwise leave it as is. 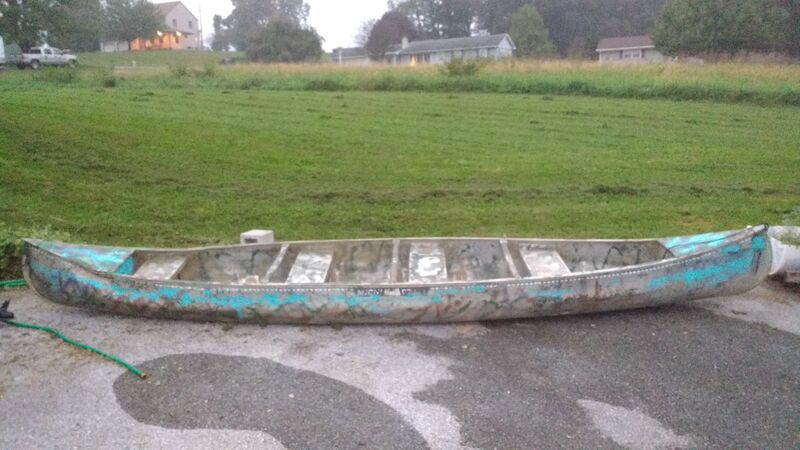 It would surely be a top contender in nearly any "ugly boat" competition. It would also be good for one of those downriver trips with a god-awful carry at the take-out that you really didn't want to haul a canoe over. Looks like some of y'all think I'm fix'n to box the compass. Happily, there are no flotation problems. No lack of port quarter navigators here. Anyone have any suggestions to make those flat aluminum seats more comfortable? Aside from remove & replace? That's what those "throw pillow" style flotation cushions (of the same era, I'm sure) were for. Since they might be hard to find, get yourself some Minicel foam and figure out a creative way to attach it (duct tape?). I'll look into that stuff. Thank you! Sleeping pad for camping might do in a pinch, but probably not as UV resistant. Using minicel foam to pad aluminum seats is certainly an option, but I would not use 3" thick plank and you can probably find cheaper sources than Chesapeake Light Craft. 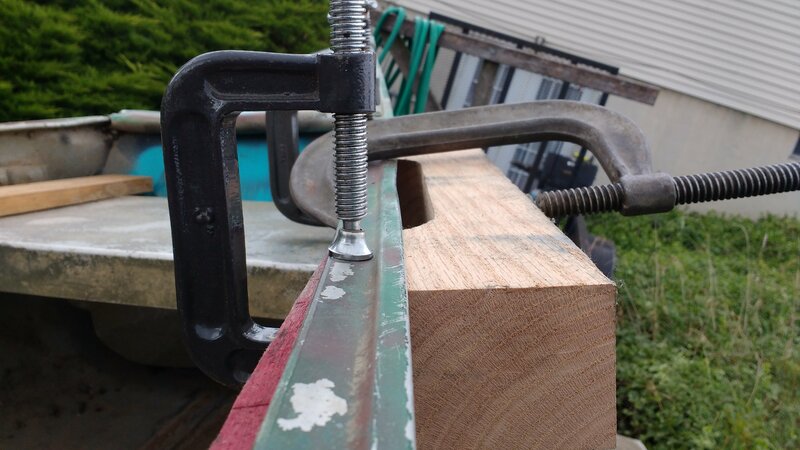 Plank that thick is good for building up pedestals, or carving out a contoured seat to put in the bottom of a kayak. Thick plank is much more expensive and won't conform to any degree of curvature as well. Plank that is 1-1 1/2" thick would work better. And I wouldn't use 3M 5200 sealant to bond it in either. I would use DAP Weldwood contact cement (flammable variety) which is much cheaper. Use steel wool on the aluminum seats to get them clean and shiny. Rough up the bonding surface of the foam with sandpaper. Apply the contact cement using a cheap "acid brush" available in nearly any hardware store and apply 2 or 3 coats to the foam. Using minicel foam to pad aluminum seats is certainly an option, but I would not use 3" thick plank and you can probably find cheaper sources than Chesapeake Light Craft. 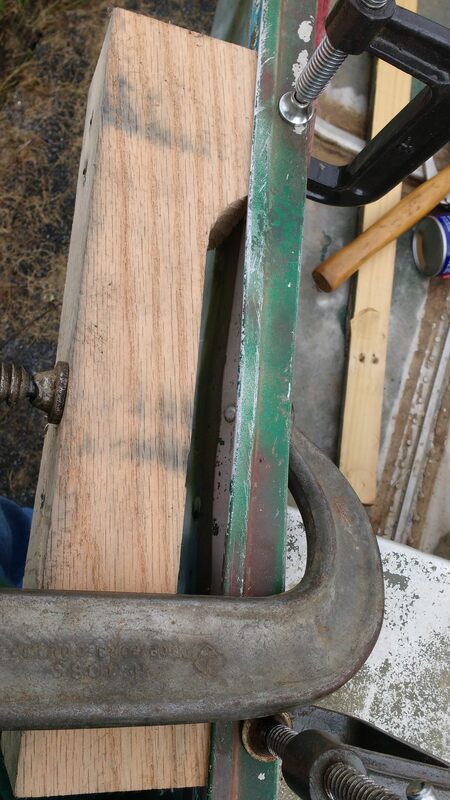 Plank that thick is good for building up pedestals, are carving out a contoured seat to put in the bottom of a kayak. 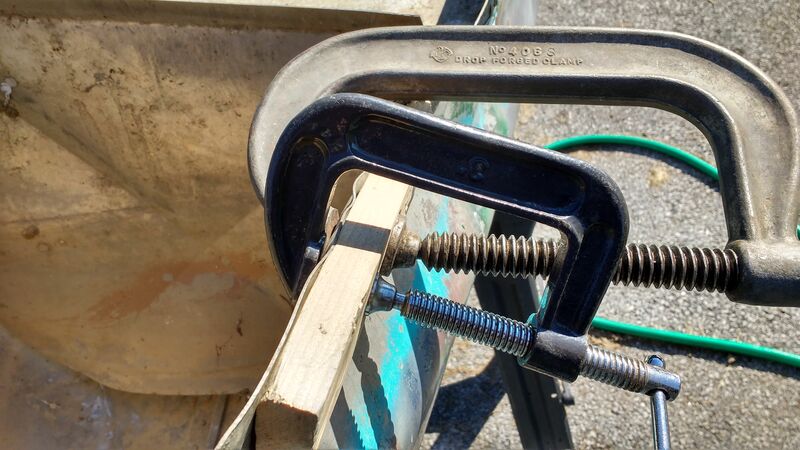 Thick plank is much more expensive and won't conform to any degree of curvature as well. Plank that is 1-1 1/2" thick would work better. And I wouldn't use 3M 5200 sealant to bond it in either. I would use DAP Weldwood contact cement (flammable variety) which is much cheaper. Use steel wool on the aluminum seats to get them clean and shiny. Rough up the bonding surface of the foam with sandpaper. Apply the contact cement using a cheap "acid brush" available in nearly any hardware store and apply 2 or 3 coats to the foam. My in law the retired Master Chief , fixed wing mech, takes on these kind of projects too just to prove he still can. And they usually come out well enough. If the rivets leak there are options. 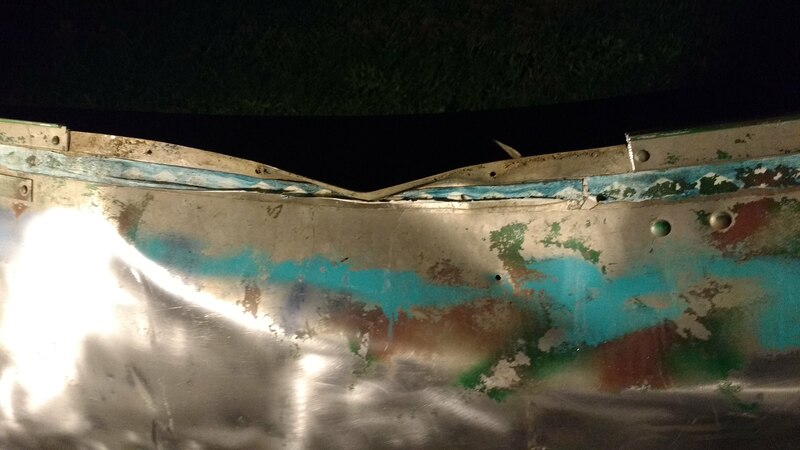 However for a southern redneck play around fishing boat Flexseal products can't be beat for fast repairs. 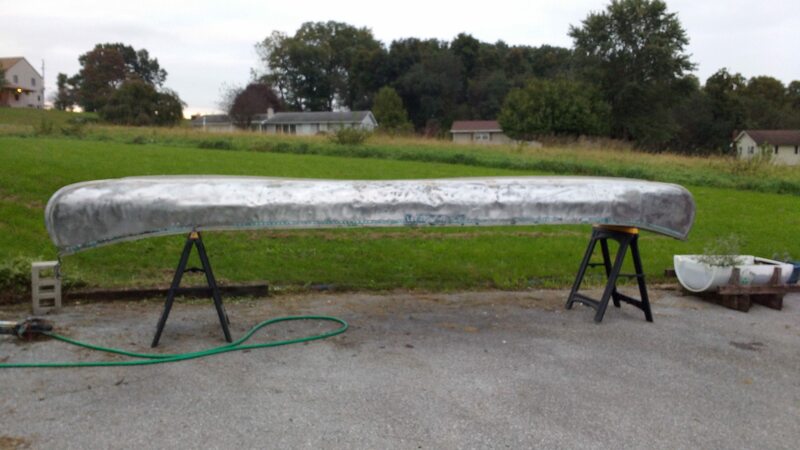 I gave the neighbor an old fiberglass canoe and he Flexseal 'ed it and uses it in his farm in the pond to fish from. That's exactly what my US Marine brother recommended! Re Flexseal - I want to hate it because it is one of those late night TV items. But I ended up trying it on my roof three yrs ago to patch a potential leak. City rubber roof, happily tilted not flat. I had a tiny leak that happened one time when the tail end of a hurricane came thru with a good bit of oomph left. No other time even with a snow load so I knew it was a pretty tiny opportunity. I figured if I got something on it before it turned major I could stave off the big job. I went up with both the spray and a roll of patch material and used both generously while I was there. Not a drop since then. 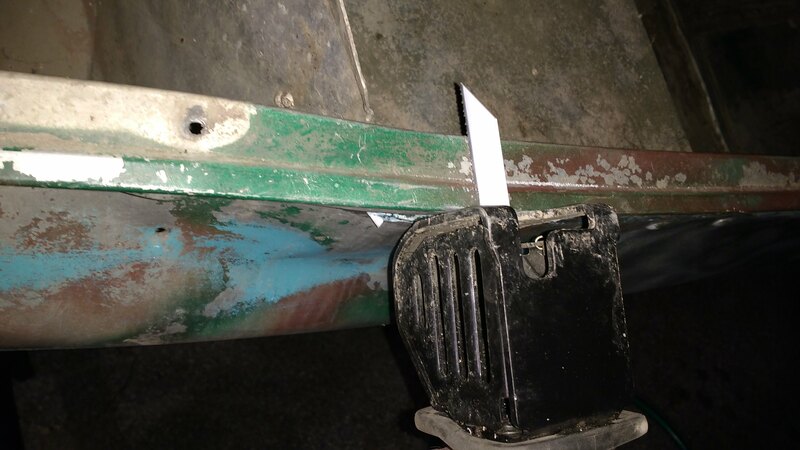 And there were a few places that were vulnerable to beginning leaks as time went on, where the seal on the edges of a piece of rubber was looking a little dry. 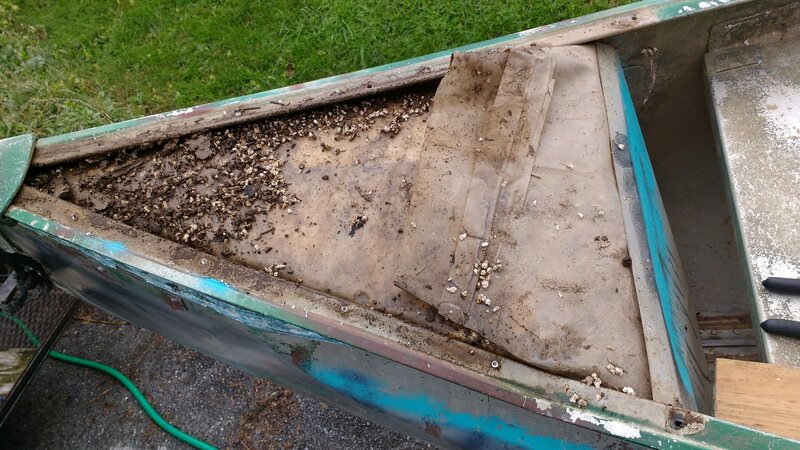 It is heavy so probably not the best plan for a boat restoration. But the stuff does work. Comes in different colors too. 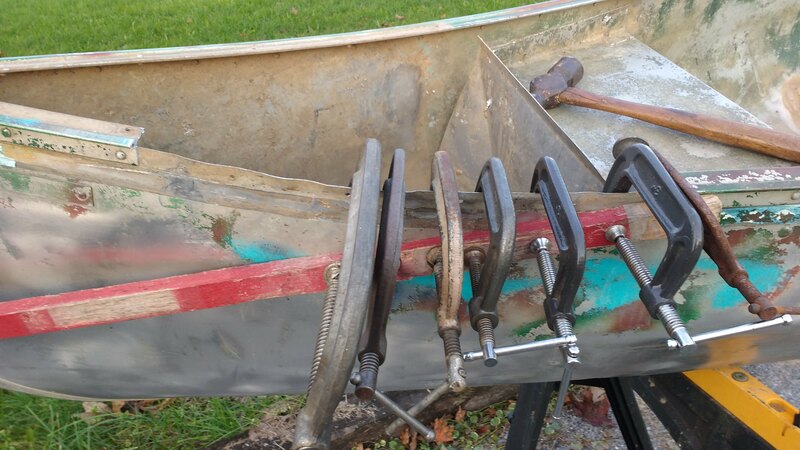 This is a canoe that i might think twice about resurrecting. Flooding, Mt. 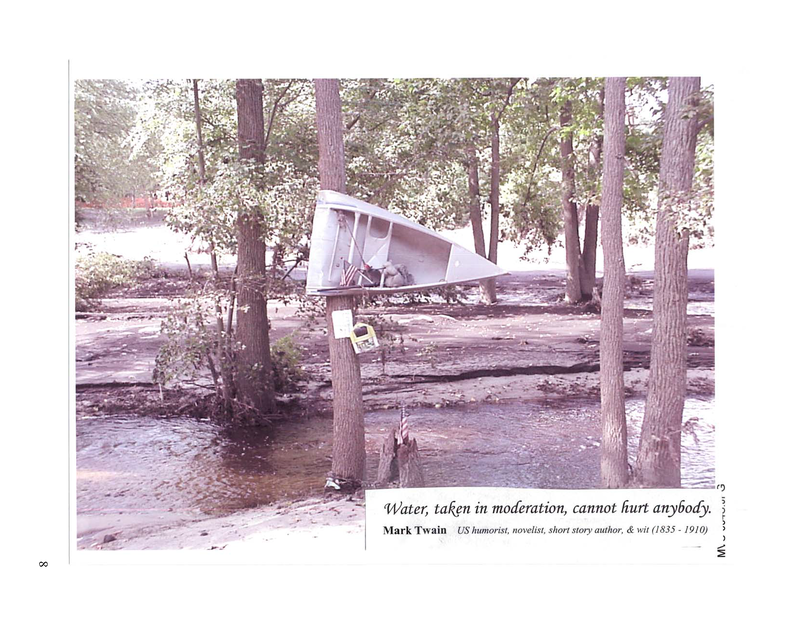 Holly, NJ, 2004. Hey Schuylkill, it's always nice to see a canoe getting some love, especially a brave canoe like yours that took a hit from a tree while waiting for you outside and never complaining. Regarding seat pads, flotation cushions may be a bit thick...they will raise your seating position. You might look for a hunter's seat pad like shown in the pic or a stadium seating pad like the one on the link. Cheap and comfy. If you get the chance I think you'd really enjoy meeting Carl from Carl's Paddlin in Lone Rock Wisconsin. 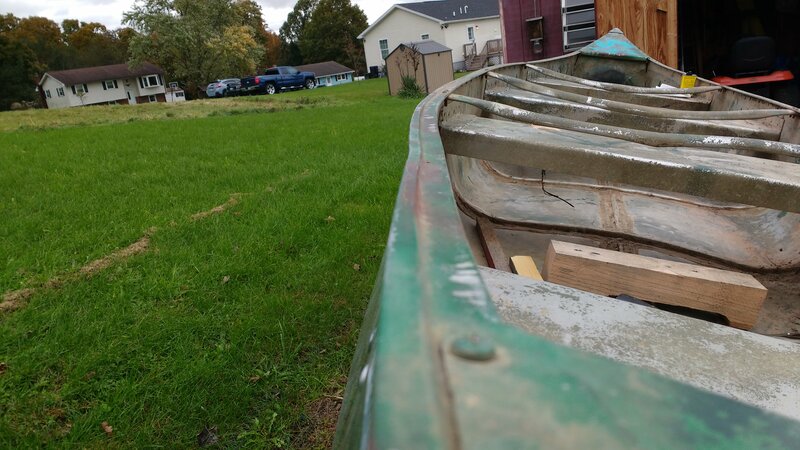 Carl has hundreds of canoes including lots of very well used boats that he has rescued that others might think are past their useful life. When you get ready to float it again post a pic on the "Show off your boat........" thread. @TomL I shall look into those! Thanks! Progress. All of the sheet metal is facing the right direction now. Next, work on straightening the top edge and then massage out two large buckles, highlighted with the green lines. Now that you have converted the peanut gallery to shop lackeys would minicell workshop flooring be thick enough to pad out those alu ( and hot ) seats? Too much i know but use the extra for cooler lining . Dont spoil the fish! would minicell workshop flooring be thick enough to pad out those alu ( and hot ) seats? Hmm, Harbor Freight has stuff like that for a lot less than $20. That sounds like an awesome idea! They even have some with a diamond plate pattern that would fit the personality of this boat! I keep thinking about what @Celia, @Overstreet and my Marine brother were saying about Flex Seal. 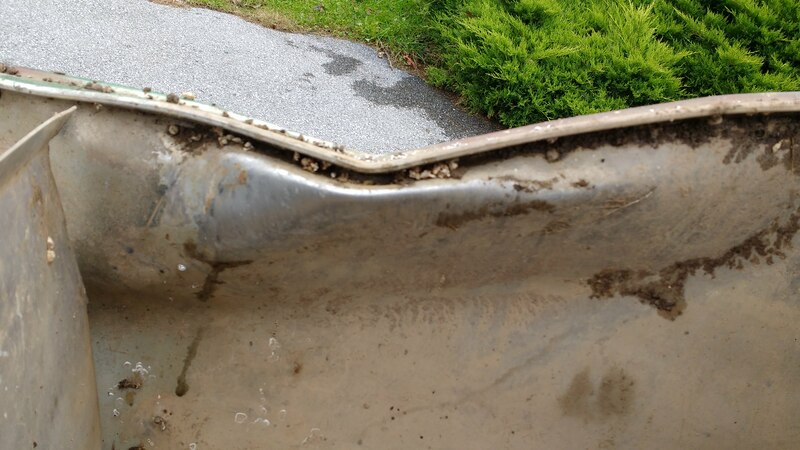 I think I have to remove the other deck, check for mouse condominiums in the foam, remove as much of the schmutz (Pennsylvania Dutch word meaning, grease, mud, goop, etc.) 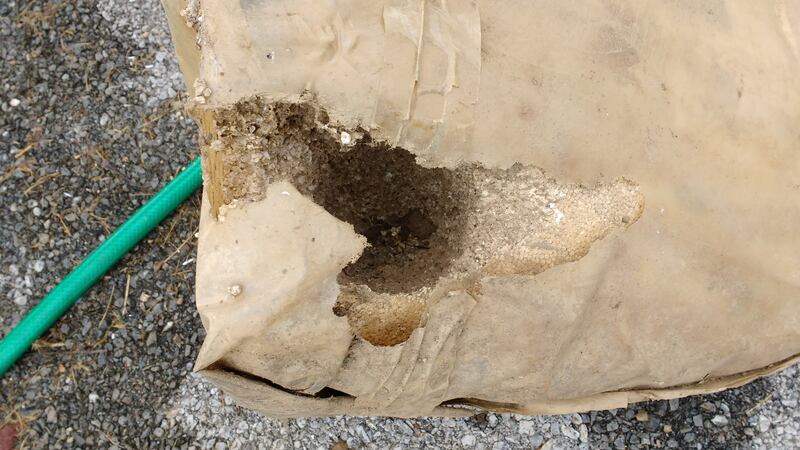 as I can that the previous owner applied to the seams and then seal everything up with Flex Seal. I would use some pour in place foam for the floatation. But it's a little pricy. Shop floor......mine is black and dark grey.....no no not for seats. I have a kayak with black seats.....ouch....unpleasant after lunch in summer. . Perhaps with closed cell insulation. Glued to the seat? Seadeck is best but that $$$ thing again. Some of those chemically-produced foam materials are very prone to absorbing water, so that's something to check before picking a brand. 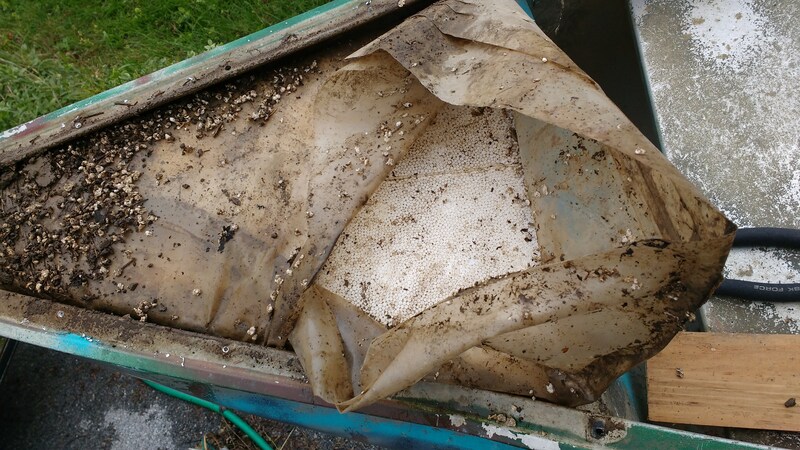 Otherwise, the "cheap kind" of Styrofoam, which is made from pressed polystyrene beads (like those cheap white coolers you can pick up in almost any kind of store for next to nothing) seems to the be standard small-boat flotation material, and I've never seen the stuff get waterlogged. I don't know where to buy the stuff in blocks, but you could just stack properly-trimmed sheets of it in the float chambers. The stock foam is mostly OK, but for a mouse house. I'll be using the original foam with Great Stuff to fill in any mouse condos. I had heard that Great Stuff was one of the foam products that is prone to absorbing water, but I don't know that for sure. I guess for short periods of immersion the risk of waterlogging probably isn't all that high. I'd be using such a small amount, I can't imagine that it would be any problem. However, since the white foam panels are available pretty inexpensively, I could just cut that to fit and glue it in place with waterproof glue. You don't want anything that flakes off, styrafoam, or holds water and gives a wet bottom. That's why this stuff is so good for it. It comes in as much as 1". Of course Qruiser usually sits on a garden kneeling pad in (or is it on?) the canoe. Cheap, low density foam doesn't last Minicell doesn't quit.